Full Family Coat of Arms with Family Crest heat pressed onto a Men's White Golf Shirt. Adult Pocketed Jersey Sport Shirt 9.0 oz. You will not be disappointed - these are top quality shirts, with a 50% cotton, 50% polyester blend Jersey. Enjoy Gilden's top quality Men's T-shirt, 50% cotton, 50% polyester blend, 10.1 oz. You will not be disappointed - these are top quality shirts. Full Family Coat of Arms with Family Crest heat pressed onto a Adult Hooded Sweatshirt 50% cotton, 50% polyester blend, 9.3 oz. Top quality sweatshirt! Full Family Coat of Arms with Family Crest heat pressed onto a Women's White Jersey Golf Shirt, 10.1 oz. 100% cotton - these golf shirts are made to last! Full Family Coat of Arms heat pressed onto a Women's White T-shirt. Enjoy Gilden's 100% Cotton Ladies T-shirt 10.1 oz. You will not be disappointed - these are top quality shirts. 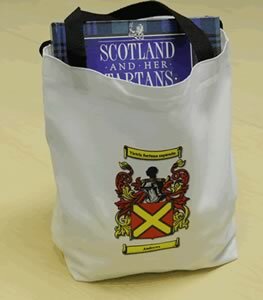 Extremely durable tote bag with family crest on one side. White with black nylon strap. Reusable in many occasions!